In the U.S., the Fed went into large-scale purchases from 2008 – 2013. They tapered the purchases gradually to zero by 2014. As a consequence, the Fed now holds US $1.8 trillion of mortgage-backed securities (MBS) and US $2.5 trillion of US Treasury Bonds. The Fed has been reluctant to reduce the balance sheet, fearing that mortgage rates and other long term borrowing cost can spike and hurt fragile US economy. However, at its meeting last March 14-15, the Fed’s Monetary Policy Committee (FOMC) agreed it should start normalizing its $4.5 trillion balance sheet later this year. Another name for this “balance sheet normalization” is “Quantitative Tightening”. The Fed’s current practice is to buy new bonds when the old bonds mature. When the Fed starts the normalization, it will taper the reinvestment of principal. In other words, it will let the old bonds mature and not reinvest to buy new ones. This way the balance sheet shrinks as the Fed receives cash from maturing bonds and not reinvest it. The Fed can also decide to reduce the size of the balance sheet more rapidly by selling its securities holding. However, the passive and predictable option of not reinvesting is more likely. 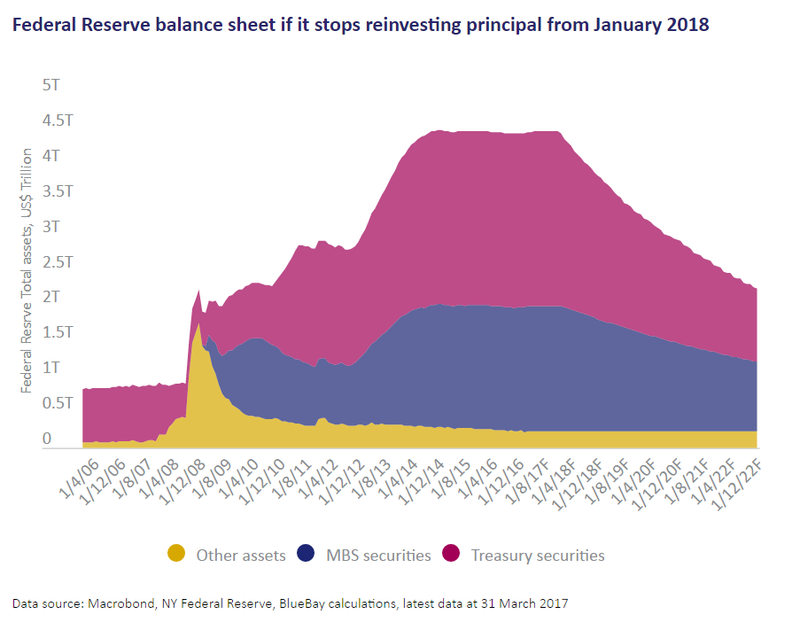 The chart below projects Fed balance sheet if the Fed stops reinvesting principal from January 2018. 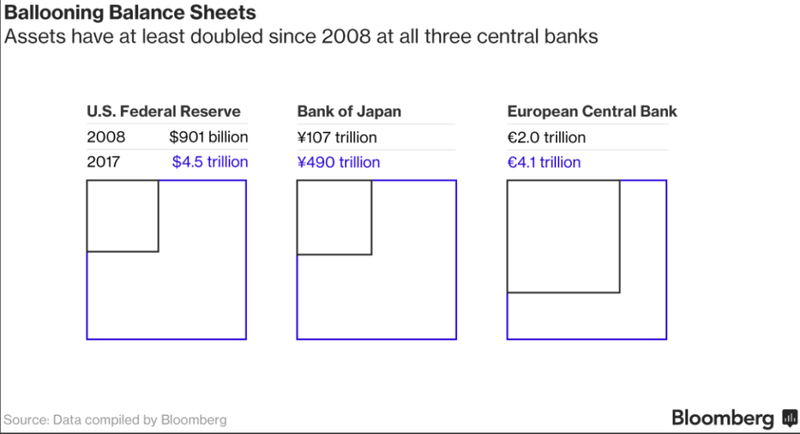 By doing so, Fed’s balance sheet should be halved by the end of 2022. The Fed wants to get back to normal monetary policy by raising short term interest rate and shrinking the balance sheet. Interest rate is expected to go back to 2.5% by late 2018 (currently at 1%) while balance sheet is expected to shrink to $2 trillion by 2022. At Fed’s meeting on Wednesday this week, the Fed could announce the blueprint on how to do it. However, if QE resulted in higher inflation expectation, higher long bond yields, and encourage the holdings of risky assets, then in QT regime, we should expect the opposite. As central bank asset purchases diminish over the coming years, there is potential of material price declines in some assets. Both the stock and bond markets have come to depend on the Fed’s programs. S&P 500 has surged more than 250% from the 2008 low while interest rates remain low by historical standard. In 2013, when Ben Bernanke accidentally hinted on QE tapering, stocks fell, interest rates rose and emerging stock and bond markets crashed, an event known as “taper tantrum”, as market worries about the implication of a less accommodative Fed. Thus, the reversal of the program, if not done the right way, can have major consequences. The 10 Year T-Note Monthly chart above shows a possible extension to the downside. 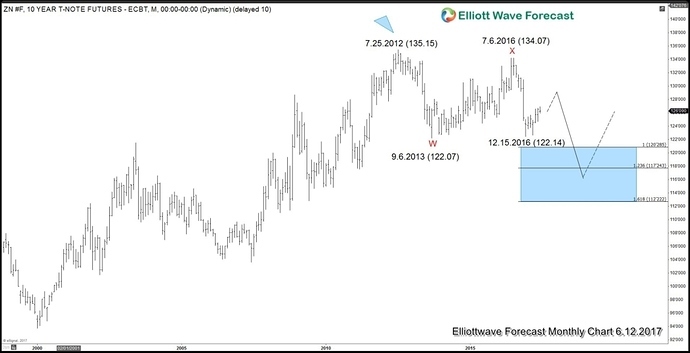 It still needs to break below 9.6.2013 low (122.07) to confirm the next leg lower is possible. Near term, 10 Year T-Note may correct cycle from 7.6.2016 high first before turning lower. When the Fed stops reinvesting the principal into new bonds, the principle of supply and demand suggests there will be more supply of Treasury debt in the market that needs to find new buyers, thus it’s possible that the bond price falls and yields rise when the Fed starts normalizing the balance sheet. The Fed’s Quantitative Tightening might have significant implication to all asset classes, including stock, bonds, and US Dollar.